As long as I can remember, there’s always been controversy surrounding the safety of tap water for human consumption vs bottled water. Now, some dog owners are wondering whether tap water is safe enough for their pets as well. According to one study led by Dr. Lorraine Backer of the Centers for Disease Control and Prevention, dogs have nothing to worry about when it comes to the risk of getting bladder cancer from drinking tap water (although humans apparently do have a risk). The reason that dogs can safely drink tap water is due to the fact that their water tends to sit for long periods of time in their bowls. So the dangerous chemicals have time to evaporate away. Plus, a dog’s digestive system is different than ours, therefore the chemicals produced when organic matter and chemicals from the tap water (like chlorine) mix just aren’t the same in dogs as they are in humans. That’s not to say that dirty water (or water that’s in a contaminated food bowl) can’t pose a risk to your dog though. While it appears that tap water is relatively safe to use for dog drinking water, many pet owners still aren’t taking any chances. 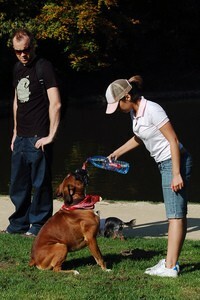 They are buying bottled dog water or they’re filtering their dog’s water instead of using water straight from the tap. See why many dog owners don’t give tap water to their dogs, along with some of the dangers lurking in your dog’s water. Many of these are regular beverage companies or vitamin companies that have decided to branch out into the pet market. Of course, we’re talking non-carbonated water here. K9 Water Co. has vitamin-enriched flavored dog drinking water. The flavors include Toilet Water, Hose Water, Puddle Water, and Gutter Water (which are technically Chicken-flavored, Lamb-flavored, Liver-flavored and Beef-flavored waters, respectively). A 4-pack will run you about $7.50, a 12-pack is about $20, and a 24-pack costs around $36. More fun facts about K9 Water for dogs. Dogdration (formerly Woof Wellness) markets their bottled dog drinking water as “a healthy liquid treat that your dog is sure to love!” In addition to giving it to your dog like regular water, they encourage other fun uses like freezing it into ice cubes for your dog to enjoy on a hot summer day, or pouring it over your dog’s food, like a gravy. It’s made from filtered deionized water and enhanced with electrolytes for hydration, ginseng for overall well-being & alertness, and glucosamine for healthy hips & joints. It’s flavored with all-natural allergen-free Peanut Butter. A 20-ounce bottle is about $4, or you can get a 12-pack for $36. PetRefresh comes in a variety of types. For example, there’s Natural, Beef, Chicken, or Fish — each with a trace of vitamins and minerals. There’s also a combination of Natural Apple Cider Vinegar, Garlic, Brewers Yeast — to naturally prevent fleas and ticks. All of these bottled waters for dogs start with pure mountain stream water at the base, then the flavorings are added. Sold in 3 different sizes ranging from 20-ounce bottles to 2.3 liter bottles, you’ll need to call for pricing. VitaPaw is pure natural water with a boatload of vitamins and minerals added. 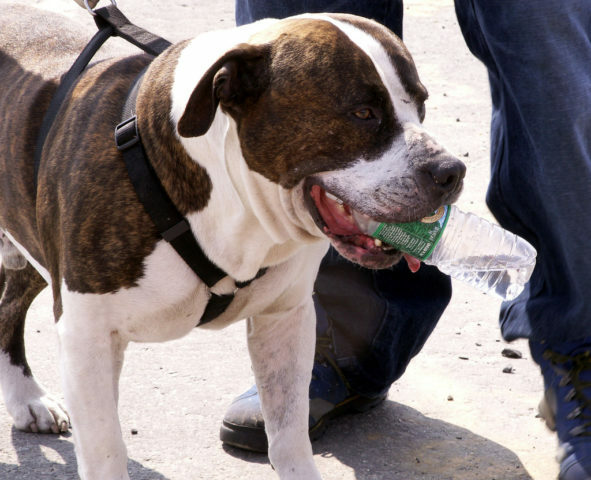 This bottled dog drinking water comes in 1/2-liter or 1-liter bottles (sold by the bottle or by the case) and come with a pop-up sports cap. Call for prices. Pet-Friendly Spring Water is manufactured in the USA and contains 100% natural spring water. There are no flavored added, and it’s human-consumption approved. Call for prices. oxygenated to increase energy and maintain fresh breath. Blue is high in magnesium to improve nerve functions while combating heart disease. Blue is also naturally oxygenated to increase energy and maintain fresh breath. Aqua Pure Breed (APB) is available at Neiman Marcus stores, or it can be delivered right to your home! To do so costs about $20 for 12 bottles a month or $60 for 48 bottles a month. See how to make your own filtered dog watering bowl! While not a necessity for your dog’s overall health and well-being, if you want to pamper your pooch and help to ensure that your dog has the purest, cleanest drinking water available, then you might want to add filtered or bottled dog water to your shopping list. Alcohol, Dogs & ‘Drunk Ice’ Don’t Mix!